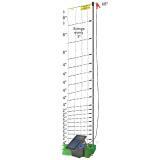 The tallest electric netting we offer (68 inches tall) so it protects gardens, lawns/yards and tree plantings from deer. String verticals every 3 in. Posts (built-in) every 8 ft., .75" dia. 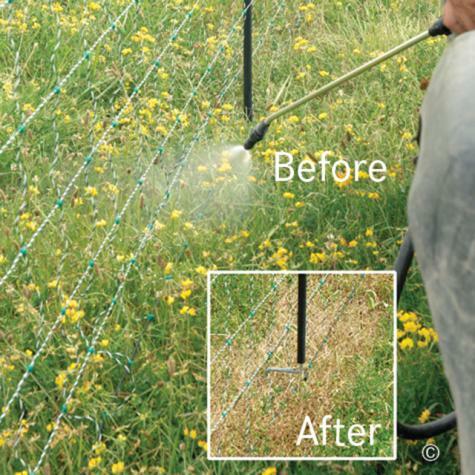 Effective against coyotes, most deer, bear, dogs, raccoons and livestock. PermaNet designs with verticals every 3 in. 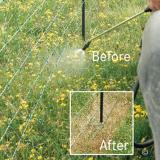 are also effective for rabbits, woodchucks, opossums, chickens, domestic ducks and geese. Designed to be left in one place for months. Has stronger posts with longer, thicker, steel spikes to support the net better through wind, rain and snow. A very good conductor. This is critical because the number of weeds contacting netting (and draining away energy from the energizer pulses) increases as days pass from spring into summer. 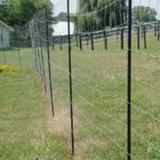 Enhanced conductivity enables the pulse energy to be evenly distributed along the fence. Has string verticals. Slightly less affected by wind. Some PermaNets have verticals every 3 in. to stop small critters from crawling through them. 68 in. to increase the "fear factor" in animals that encounter it. It's not a fence that folks should ever try to step over! The same “unroll and then unfold” process applies to all electrified nets. However, this net is heavier and post spikes are larger than our other nets (therefore more difficult to push into the soil). Because the rolls are long and heavy, installation requires 2 people. Extra line posts are usually not necessary but, due to the extra height and weight of this net, extra supports such as 11/16" FiberRods or T Posts are useful at corners, curves and ends. A steel post driver or hammer is needed to install these types of support posts. You will need a fence energizer to electrify the net. 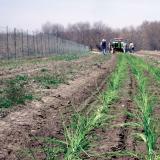 This fence, because it has so many energized wires so close to the soil and is intended to stop deer and “furry critters,” is likely to experience high weed contact. Therefore an energizer with a high joule output (preferably a plug-in unit) is best. Monitor the voltage levels. It should be above 2000 volts if the soil is moist and 3500 volts if soil is dry. If not, check the fence for energy leaks. If the fence is near trees, check it after high winds for fallen branches & debris.